McElroy Smiles By Design is proud to be a certified & preferred provider of Invisalign in Encinitas, CA. This revolutionary orthodontic treatment straightens your smile without needing the wires and brackets typically used with braces. Instead, Invisalign employs a series of clear, custom-crafted, removable appliances called aligners. Each aligner is precisely designed by the Invisalign lab to represent a different stage of your smile as the teeth are moved closer and closer towards their ideal alignment. After impressions are taken and our office has received your customized set, your responsibility as a patient is simple – all you need to do is wear each aligner for a certain amount of time (around two weeks, in most cases) and then switch to the next one in the series. We also ask that you attend brief, routine check-ups at our practice; this allows our Invisalign certified dentist in Encinitas to check your progress and ensure that your improved smile is coming along smoothly. Discretion — As the name implies, Invisalign aligners are virtually unnoticeable when worn. This lets you maintain your natural look and self-confidence while you undergo treatment. Comfort — Orthodontic brackets and wires have the tendency to be uncomfortable, and any kind of damage can result in oral irritation and pain. Invisalign consists of only clear, smooth plastic that’s been customized for your unique mouth, making it much more seamless and enjoyable to wear. No Lifestyle Changes — While braces may require you to change your eating habits, wear specialized mouthguards during sports, or relearn how to play some musical instruments, Invisalign allows you total freedom to enjoy your daily activities. Simply remove your aligners while you eat or play, and pop them back on again when you’re finished. In fact, it’s perfectly fine to take your aligner out for up to an hour or two, so you can enjoy any fun event to the fullest! Improved Dental Health — Unlike braces, Invisalign doesn’t have extra nooks and crannies to trap dangerous bacteria in your mouth. Invisalign doesn’t require any special brushing or flossing techniques to keep your teeth healthy, either. Just take your aligners out to brush and floss as normal. Faster Treatment — Traditional braces can require multiple years to be fully effective. Alternatively, Invisalign treatment usually completes in a much speedier time frame – only 8 to 18 months! 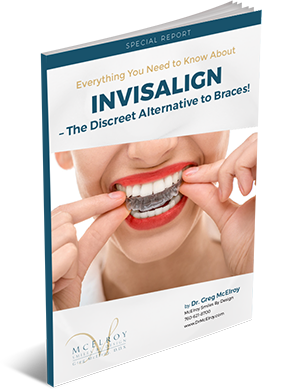 McElroy Smiles By Design also offers ClearCorrect Braces as an alternative to Invisalign for patients who are interested in exploring all their teeth straightening options. Much like Invisalign, ClearCorrect utilizes a series of clear removable aligners to straighten your teeth, and it carries all the same benefits as Invisalign. During your initial exam and consultation for teeth straightening, Dr. McElroy will be happy to discuss ClearCorrect as a potential alternative to Invisalign. To learn more about ClearCorrect and Invisalign in Encinitas, CA, and to find out if you would be a great candidate for this revolutionary way to straighten your teeth, call us at 760.621.8700. To schedule your initial exam and consultation, click here. Come experience McElroy Smiles By Design! You will see our preferred provider of Invisalign in Encinitas, CA, offers innovative and affordable Invisalign in Encinitas, CA, Carlsbad, CA, San Marcos, CA, Vista, CA, Oceanside, CA, Solana Beach, CA, Del Mar, CA, Ranco Santa Fe, CA, Escondido, CA and San Diego, CA. We look forward to helping you achieve your most confident smile!